"The Middle Ages" is an era of about one thousand years. 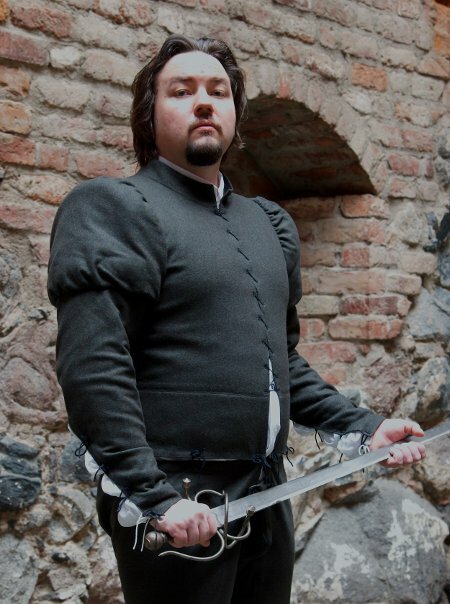 Costume wise I find the late medieval era, 14th and 15th centuries most interesting. And where my costuming inspiration leads, von Mannheims shall follow. 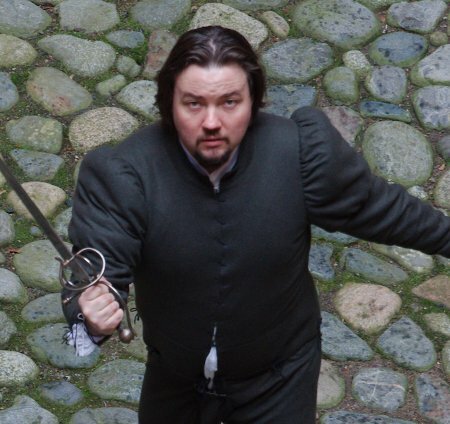 Medievalists usually begin with a t-shaped tunic, but, being me, I became obsessed with the idea of a 15th century doublet, especially as Jarno thought it would look cool. The doublet was worn with a pair of hose, which by 15th century had developed into long joined hose which looks like tightly fitting pants or leggins. 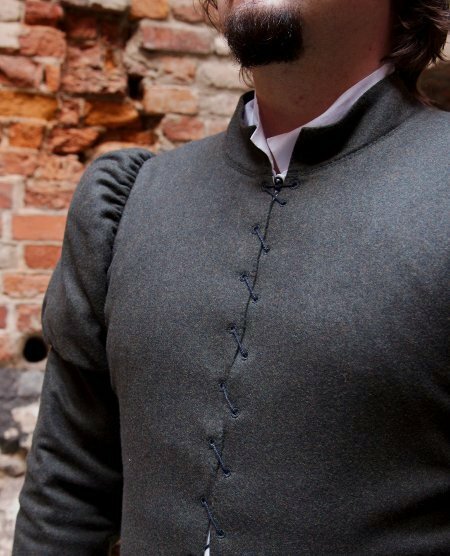 The combination of doublet and joined hose was the foundation of a well-dressed man's outfit, and elaborate outer garments were worn over them. 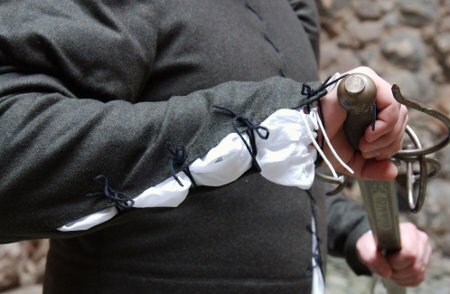 My main source for designing the doublet was Thursfield's "The medieval tailor's assistant", though I also used some internet sources, mainly this. The doublet is dated to mid 15th century. The bodice, which would be mostly hidden beneath outer garments is simple with a basic front lacing closure while the sleeves are more elaborate. The padded shoulders create the fashionable silhouette while the lower sleeves open at the back seam to reveal the shirt sleeves. For the material I chose dark green wool flannel, which I thought would go with many different coloured garments. I wanted the same material on both the doublet and hose, but on afterthought it would have been wiser to pick a suitable material for each separately. While the wool flannel works well for the stiff doublet the hose needs a more loosely wowen (preferablt twill) material for more elasticity. I based my pattern on Thursfield's and made some mock ups to perfect it. 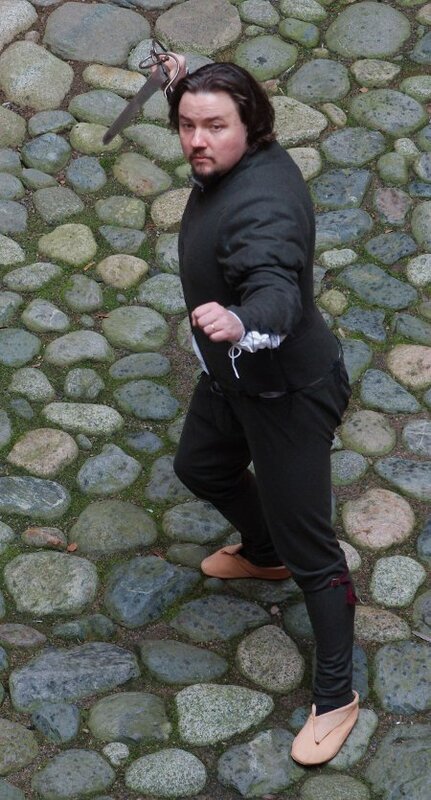 If one is to believe period pictures, you can achieve a corseted looking silhouette with a tightly fitted doublet, but I aimed for a snug but comfortabe fit. While fitting the back I ended up with a back seam so curved that it began to form horizontal wrinkles between the shoulder blades. The obvious, though not an orthodox solution was to throw in a dart. As it seemed to work, I did it. As I was in a hurry to get into the hand sewing stage so that I could work on road trips on my summer holiday I decided to cut the bodice and think about the sleeves later. When planning the construction the biggest problem was to find a compromise between a period look and all the layers it demands and the poor wearer's comfort in modern buildings with central heating, especially as Jarno was also performing with a dancing group. Any padding save for the sleeve was thus out of the question. 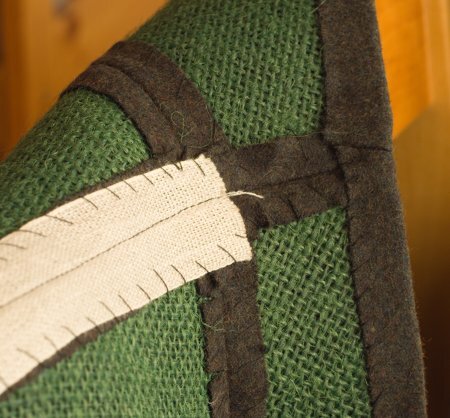 I used stiff jute canvas interlining for the shoulders, front edges and the collar, and also for the whole of skirt pieces as the hose lacings would bring strain on them. I also reinforced any seams likely to stretch with cotton tape, and the waist- and shoulder seams with a wider linen tape. For the lining I used cotton-linen mix, except for the collar which I lined with the neater thin black linen. I ironed the wool flannel to turn over the edges of the interlining and attached the seam allowances on the interlining by hand. Then I pinned the lining on place and hand-stitched through all layers. I also hand-stitches all the seams to keep the lining firmly on it's place. The effort paid off, and the outcome is a nice stiff bodice. Then I worked the lacing eyelets on the front edges. With the bodice almost finished now I began to work on the sleeves. At this point I chose to differ a bit from Thursfield's teachings and go to the direction the pattern naturally evolved through mock up fittings. 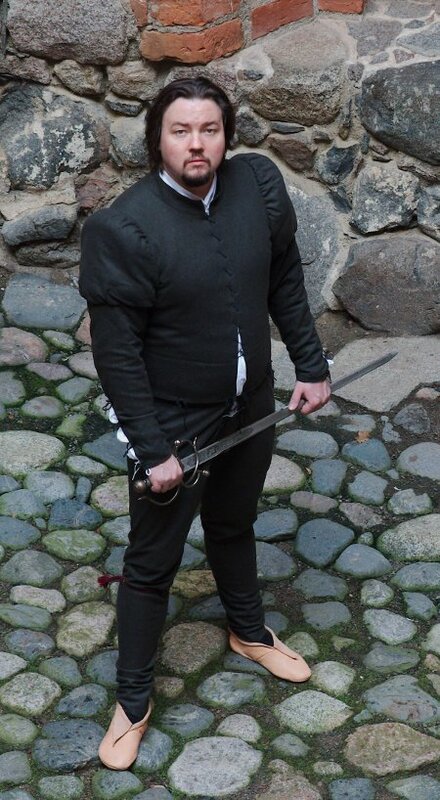 Thursfield seems to add almost no ease at all on sleeveheads, which may well be period, but at least on a garment like doublet with notably puffed sleeves I didn't see anything wrong in adding some on the puff lining too. Thursfield also simply cuts her basic sleeve pattern in two for the puff lining and the lower sleeve, but I found out that my pattern worked so much better when I cut the lower sleeve quite tight all the way up to the joining seam and flared the puff lining at the sleeve head to get some more moving allowance for the shoulder, especially as the sleeves are set quite high compared to modern sleeves. On the lower sleeve the challenge was to get tight fit while still having the elbow move freely. I drafted the back seam quite long and thus curved and also raised the joining seam a bit at the back. When I was happy with the basic sleeve I moved on to the puff. 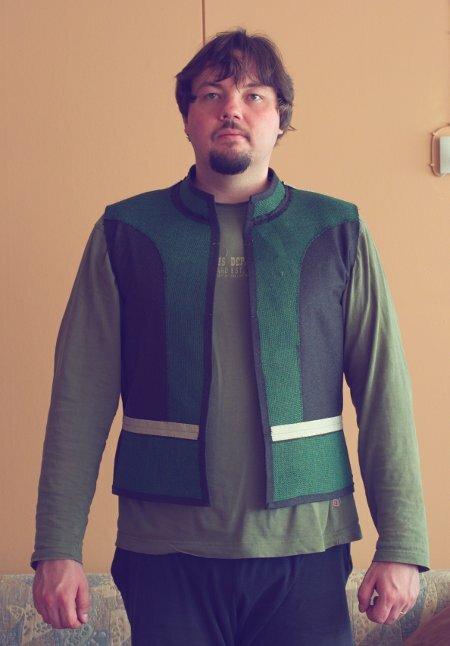 Here I think is really some sort of mistake in Thursfield's pattern, as it makes you put ridiculous amount of extra fullness at one point of the front of the sleeve. The whole puff scaled by her instructions is also quite large compared to the quite modest puff on the picture. Anyway, I took off the extra fullness on the front and scaled the puff a bit smaller all around, and at last it seemed to work well enough. I began making uo the sleeves at the lower parts. 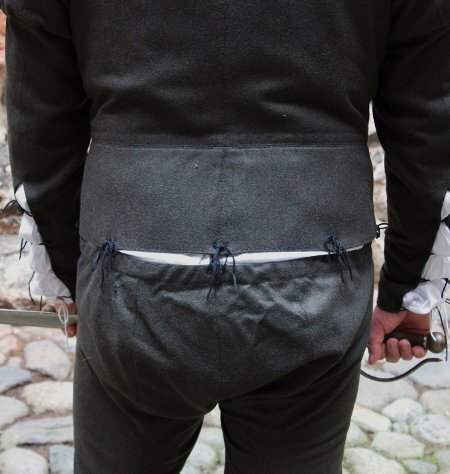 I reinforced the back seam slit edges with linen tape, lined them with the same black linen as the collar and worked the eyelets at the slit edges. By the way, I'm aware that my choise of lining is a bit non-period too, since obviously deep black linen was not around in the Middle Ages due to the dye technology of the time. On the other hand, Thursfield does mention black linen. Anyway, i used it because I wanted a neat lining to a dark colored garment, and it doesn't show much anyway. I made the puff lining of linen-cotton mix, and sewed rolls of thick wool on it to support the puff. Thursfields tells you to put two rolls per sleeve, but it looked a bit skimpy so I decided to add two more to fill out the puff. Jarno has such masculine shoulders that he needs bigger shoulder puffs too! I lined the wool flannel of the puff with the linen-cotton mix to prevent the outlines of the rolls from showing through. I sewed the lower sleev between the outer puff and the puff lining, and then gathered the puff and sewed it on the shoulder. 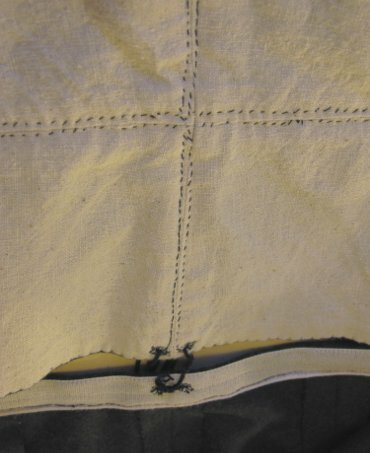 The lining followed close to the puff seam. It's always a great moment to have the sleeves successfully set in. 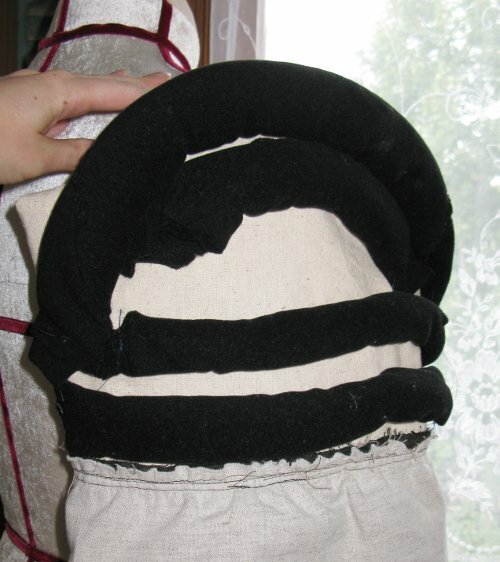 Now the doublet was almost finished, all that remained was to work the lacing eyelets on the skirts. So, it was time to begin on the hose. Like Thursfield tells us, extra length in the legs is the most important thing, as it gives moving allowance for the knee. The problem was that after a moment's wear the material gives in a bit and causes all this extra length to fall on the ankle. Happily I later got around making garters, which helped a bit. As I mentioned, the construction of the hose was in itself quite simple. I sewed the seams with a narrow zig zag to maintain the elasticity. I reinforced the waist with a doubled linen tape to support the eyelets. 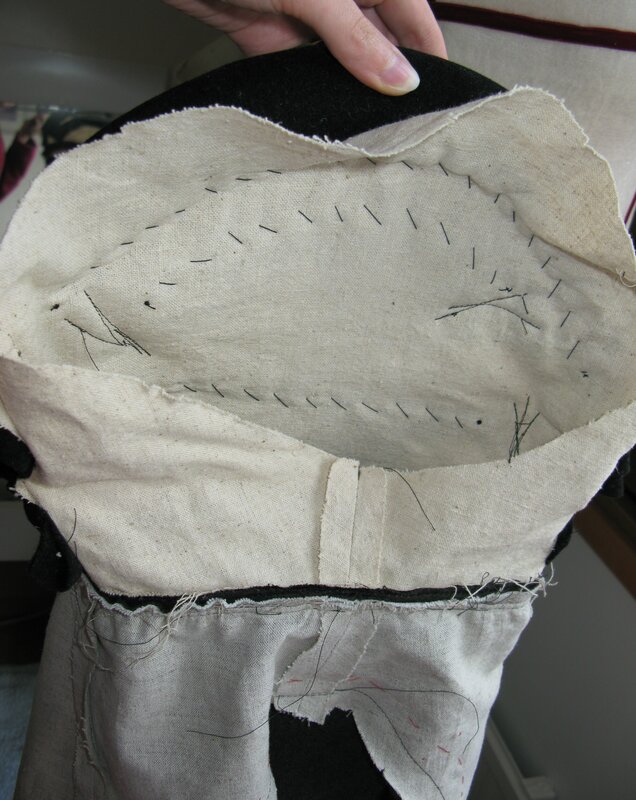 The codpiece is lined with cotton-linen mix and attached at the bottom edge. 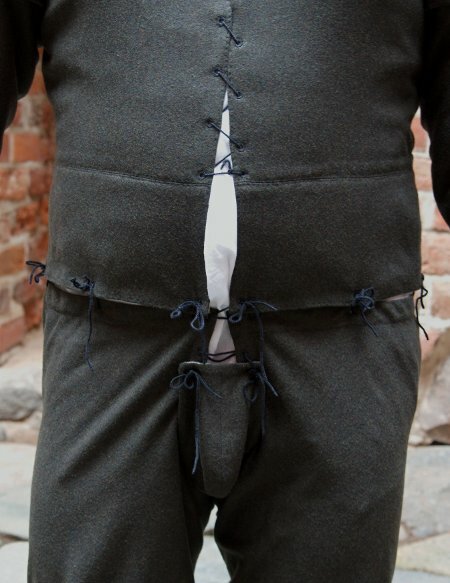 In the pictures the back laces are laced tight, but in real life they have to be worn much looser to allow sitting comfortably, which has the side-effect of the shirt billowing out between the doublet and the hose. The doublet and hose have quite a number of lacings between them. I had already had a foretaste of this fact while making all the eyelets (actually some of the last ones were finished only after the first wear), and near the deadline, our first medieval faire I realized that I needed to make the laces too. My first attempt on them was to plait woollen knitting thread, which produced attractive but highly impractical laces and the ends were so fluffy and hard to get through the small eyelets. I had planned to finish the ends with metal aiglets but of course small enough ones were nowhere to be found at the time. Happily Jarno only had to suffer the hardships of difficult lacing once, for at the faire I was randomly inspired to buy a lucet fork, and when trying it out realised that I had stumbled accross the perfect tool to make smooth, durable cord with neat ends. Although the hose have some problems, they are my first attempt after all, and I'm really happy with the doublet. Especially the sleeves turned out very nice. It used to fit even better than it does in the pictures, though, since Jarno has gained some weight since I finished it. 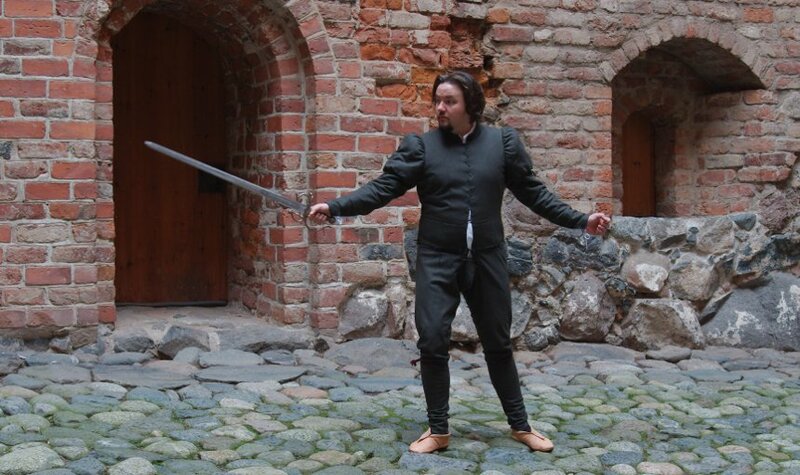 Unfortunately the doublet is rather warm to wear, and even though I got the improved version of the lacing cords the laced hose are still impractical in wear for someone used to the ease of modern clothing and lacking well-trained servants. My next medieval sewing project for Jarno were to be more relaxed wear, but he likes this one too when temperature is low enough. And of course one must preen in fashionable finery once in a while! The shoes are made by Lauri Niskanen. Many thanks for completing the outfit!